I'm trying really hard to embrace Winter. And today was a really nice, non-Winter, almost feeling like Spring day. Nonetheless, everything is all dead and brown and gray. What is green, is a flat, dull green. It's just so uninspiring. I've determined, I don't like January. But, alas, it's January, and there's nothing I can do about it. So whether I like it or not, it's here and I must embrace it rather than grasp and crave for something else. That's the yoga we can find in everything, everywhere. Yoga teaches us that grasping and craving for something other than what is causes us suffering. So we must abide by Aparigraha, non-craving or non-grasping. Seriously, why bother wishing it wasn't January? I would simply be wasting precious mind space and energy. In an effort to practice this I took the photo above. To find some beauty in all this dead of winter. 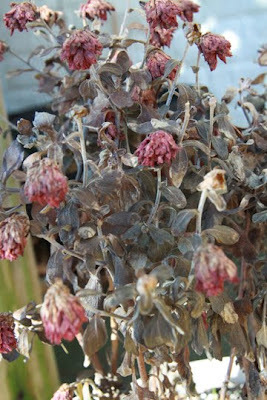 Even though the plant is dead, there is still color in dried blooms. There's life in the plant, in it's texture and movement. Realizing this makes it all just a little better.